There is considerable agreement that more successful learners are active, engaged, and self-regulating learners who understand and are motivated to apply learning strategies under appropriate conditions. One important strategic activity is seeking help when necessary, rather than giving up or engaging in fruitless persistence. Research on strategic help seeking has matured significantly in recent years. This volume captures the current state of knowledge, research, and theory on help seeking as a strategic learning resource. It is international in scope, with contributors from the U.S., the Netherlands, Japan, and Israel. As a whole, the book suggests that strategic (adaptive) help seeking is a critical school readiness skill that is facilitated by mastery-oriented classroom achievement and social goals, by teachers who invite questions rather than those who ask them, and by cultural characteristics that support student inquiry. A conceptual overview is followed by three chapters that examine help seeking from complementary theoretical perspectives and make important distinctions between forms of help seeking; two chapters that focus on how learners' achievement and social goals affect classroom help seeking; one chapter specifically devoted to cross-cultural comparisons of help seeking in Western cultures and in Japan; two chapters that examine the most frequent manifestation of help seeking--that of question asking; and one chapter that explores help-seeking in the information age (the library reference process, information technology, and computer-mediated communication). All chapters include attention to the implications of research and theory for help seeking in instructional settings. 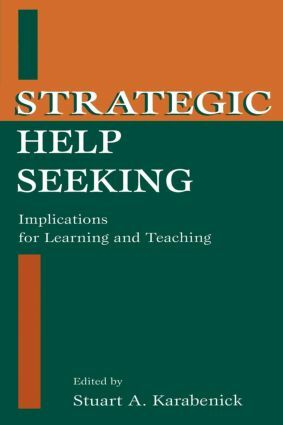 Strategic Help Seeking is an excellent resource for educational researchers and practitioners including teachers, school administrators, instructional designers, reference librarians. "All authors consider implications for learning and teaching, and each chapter has abundant references. Useful for graduate students, faculty and researchers, and professionals and practitioners." "The coverage is thorough, deep, and broad….The quality of the scholarship is first rate throughout." Contents: Preface. S.A. Karabenick, Help Seeking as a Strategic Resource. R.S. Newman, Adaptive Help Seeking: A Role of Social Interaction in Self-Regulated Learning. S. Nelson-Le Gall, L. Resnick, Help Seeking, Achievement Motivation, and the Social Practice of Intelligence in School. A. Nadler, Relationships, Esteem, and Achievement Perspectives on Autonomous and Dependent Help Seeking. A. Arbreton, Student Goal Orientation and Help-Seeking Strategy Use. A.M. Ryan, P.R. Pintrich, Achievement and Social Motivational Influences on Help Seeking in the Classroom. D.W. Shwalb, S. Sukemune, Help Seeking in the Japanese College Classroom: Cultural, Developmental, and Social-Psychological Influences. J.T. Dillon, Theory and Practice of Student Questioning. H. van der Meij, The Great Divide Between Teacher and Student Questioning. S.A. Karabenick, J. Keefer, Help Seeking in the Information Age.